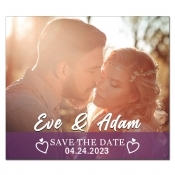 With all that stressful wedding planning and arrangements, you can easily save on efforts by sending a full color wedding save the date magnets. 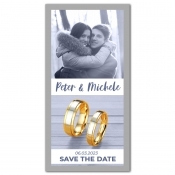 These personalized save the date magnets are a great way to announce your wedding and ensure maximum guest participation at the event. A carefully designed pre-wedding invitation not only sets tone and mood for the occasion but also indicates that a formal wedding invitation will follow shortly. You can save on online design proof, art setup and shipping anywhere within the contiguous USA. A wedding can be termed as a mélange of emotions, rituals, beautiful moments, food, music, diamonds and various other things. Everyone wants to make it special and memorable because wedding is a bond for a lifetime. 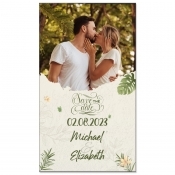 From selecting pre-wedding invites to wedding invitations and wedding styles, couples are getting finicky about their choices and methods of expressing their big excitement. 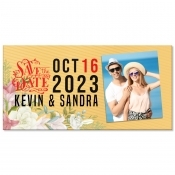 They can easily resort to wedding save the date magnets to let the cat out the bag. They can use it for expressing their emotions, announcing their big day, venue and other details without overdoing their budget. 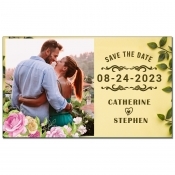 Wedding save the date cards are nothing new and they have been around for a while, whereas save the date wedding magnets are new and hot. Many couples favor the sticky wedding invitations over paper counterparts because they know that the invitation will be remembered. Couples also understand that it will double up as a wedding memoir after their occasion rolls by. Animal Theme Wedding Magnets – Add animated punch to your wedding announcements. Perfect to announce animal themed or wildlife safari theme wedding! 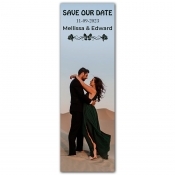 Beach Theme Wedding Magnets –Trigger an ocean of emotions within your guests! Cultures Theme Wedding Magnets – Paint your cultural pride in full color. 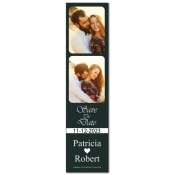 Destination Theme Wedding Magnets – Make them ready to join you in new locales. Flowers Theme Wedding Magnets – Spread the flower power without actually spending on flowers. Patterns Theme Wedding Magnets – Perfect way to express your decision with uniqueness and creativity. 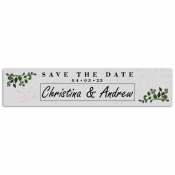 Seasons Theme Wedding Magnets – Allow your love to season before their eyes. 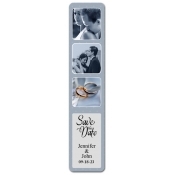 Classic Theme Wedding Magnets – Classy way to announce your decision to unite by soul. Photo Booth Wedding Save the Date Magnets – Make them believe you are in love and wish to give special meaning to this relationship. Add images without adding up charges. 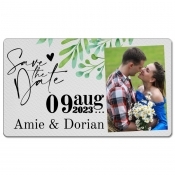 Heart Shaped Wedding Save the Date Magnets – Romance is the king of your occasion and you cannot deny it! 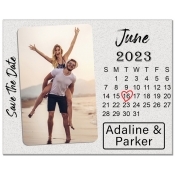 Large Wedding Save the Date Magnets – Perfect way to splurge your excitement and announce your decision to unite in life. 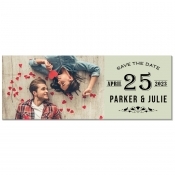 Mini Wedding Save the Date Magnets – Great to send intimate and personalized wedding announcements. 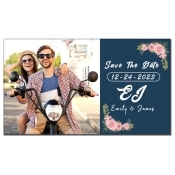 Coffee Cup Wedding Save the Date Magnets – Caffeinate your announcement by sending away these large save the date magnets. 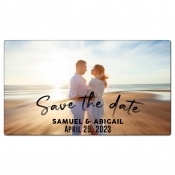 You can avail free online design proof, free art setup and free shipping on all these customized save the date wedding magnets and other personalized magnets. We can help you in designing from scratch at no additional costs. We offer the best prices on bulk orders of these custom magnets. 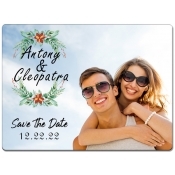 To know more about customization, discounts, full color printing, free shipping and other details about these pre-wedding invitation magnets, feel free to contact us at 855-762-4638 (Toll Free) or write to us at info@CMagnets.com.